Using the Kingfisher coloured mortar for pointing can help you to significantly enhance the appearance of your project. It can be used to either aesthetically match your brickwork or be used to contrast for a beautiful effect. As a waterproof pointing mortar, this product is second to none. Our coloured mortar is available in a wide range of colours including Dark Grey, Heritage, Light Grey and Sandstone. 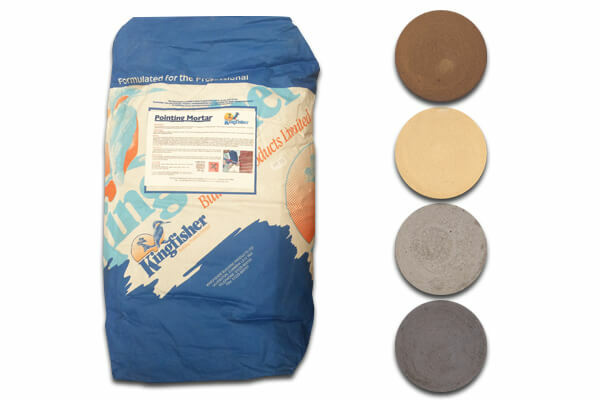 With Kingfisher, you can rest assured that you are receiving only the finest coloured waterproof pointing mortar. Our prices are very competitive, offering value for money that is second to none. For more information regarding our coloured mortar mix, contact us today. Pointing Mortar for Bedding, Pointing, Repointing & Rendering. 10kg mortar will repoint 1 square metre of brickwork with joints 10mm wide x 20mm deep. 10kg mortar will repoint 17 linear metres with one continuous joint 10mm wide x 20mm deep. 15kg will cover 1 square metre of render at 10mm thick. These quantities are approximate, don't forget to allow for wastage, typically waste 5% allowance for render. PLEASE NOTE: The product requires the addition of “Kingfisher Pointing Solution” diluted with water (1 part “Pointing Solution” to 5 parts water) to give a non-shrink, waterproof and decorative finish. Excellent product which is simple to mix and use. I also bought the Quickpoint gun, pointing Solution and Mortar rake kit - so I had everything required to make a professional job at a fraction of the cost.